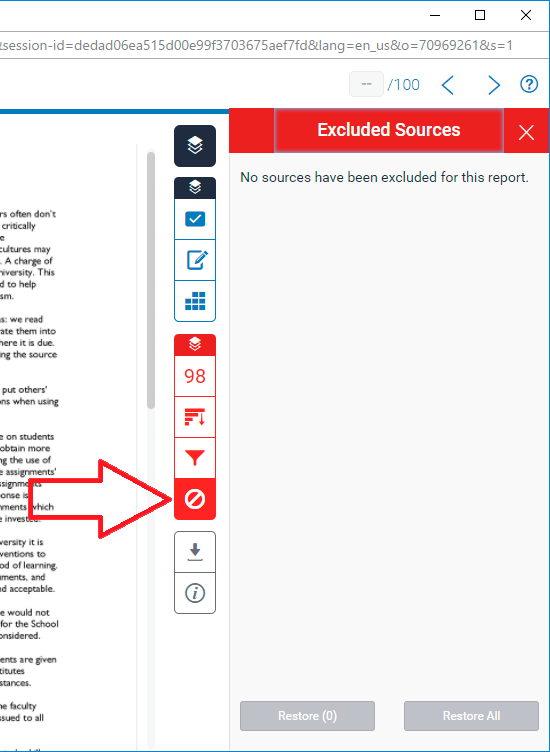 This guide explains how to export a rubric or grading form from Turnitin. You may wish to do this if you have a colleague who wishes to re-use your rubric or edit it for their own use. In order to do this, you must first export a rubric (.rbc) file which you send to your colleague. 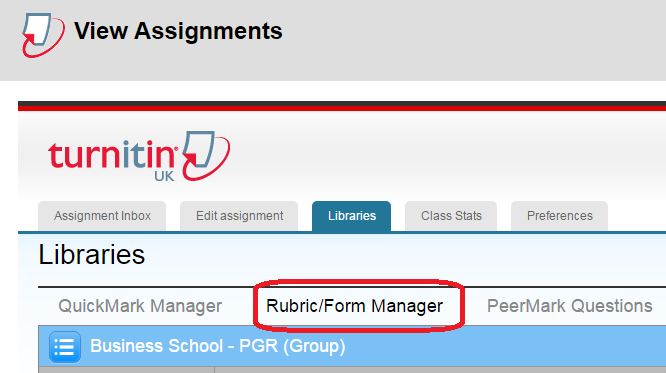 They will then be able to import the rubric file into their own Blackboard-Turnitin account. 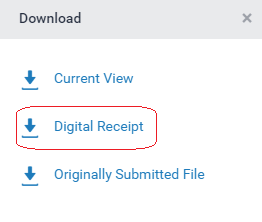 Note that when a rubric is exported and then imported, the imported rubric is treated as a completely new rubric and has no connection to your original rubric. As a reminder, rubrics and grading forms are attached to your user account rather than to a specific course. 7. Save the .rbc rubric file to a location on your hard drive. 8. Once you’ve saved this file, you can send a copy of the file to your colleague (for instance by email). This allows them to import the rubric and edit it to meet their requirements without affecting your original rubric. 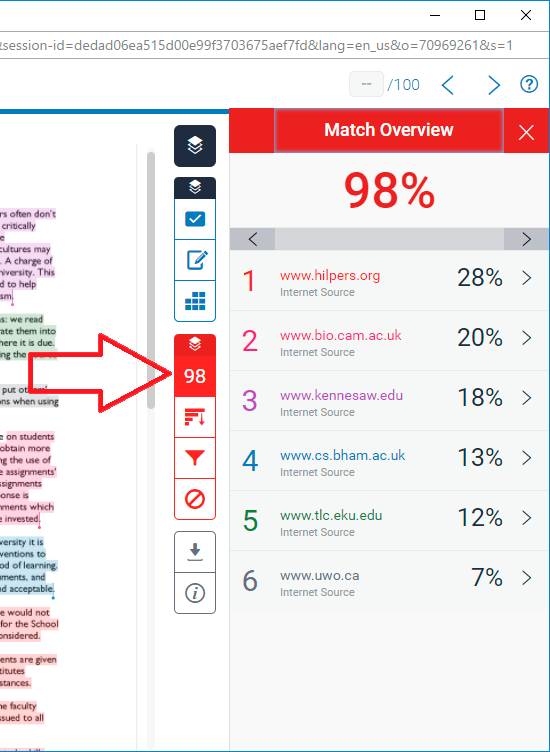 This guide explains how to view and interact with your Similarity Report in Turnitin (if your tutor has allowed you to view your report). 1. Login to Blackboard and browse to the relevant course. 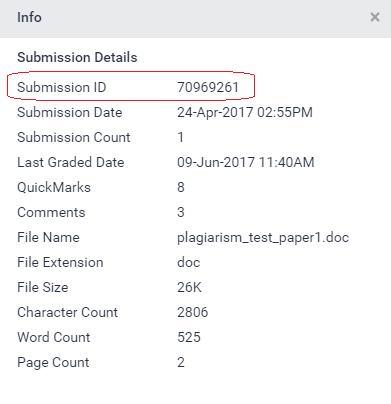 Once you are in your course, locate the content area where the submission link is, and click on it (for example, Assignments). 2. 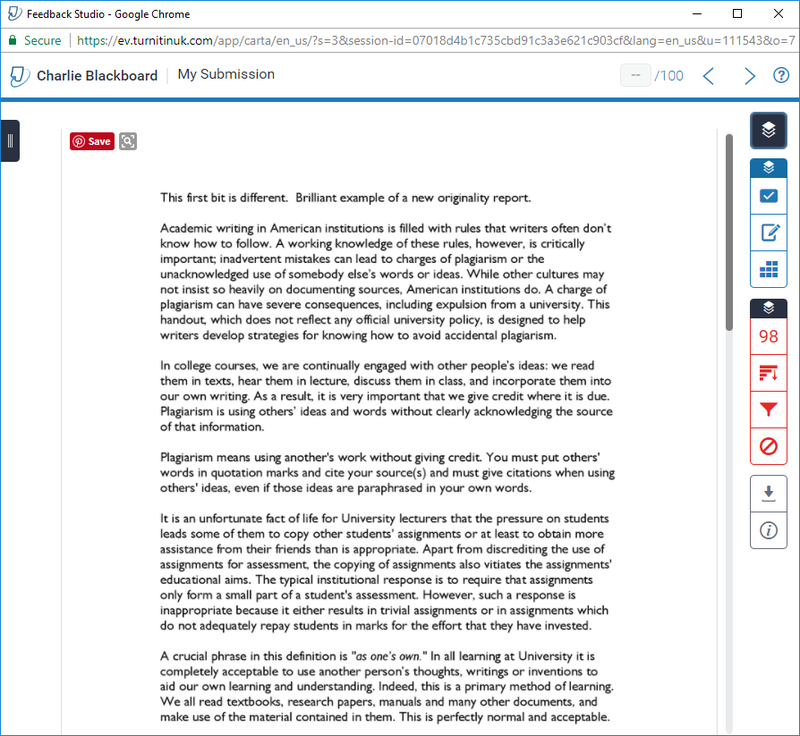 Locate the Turnitin Assignment link, which will look similar to the screenshot above, but will have a different name. Click on the View / Complete link. This will take you into your assignment homepage for this specific assignment. This is the same link you clicked on when you first submitted your assignment. 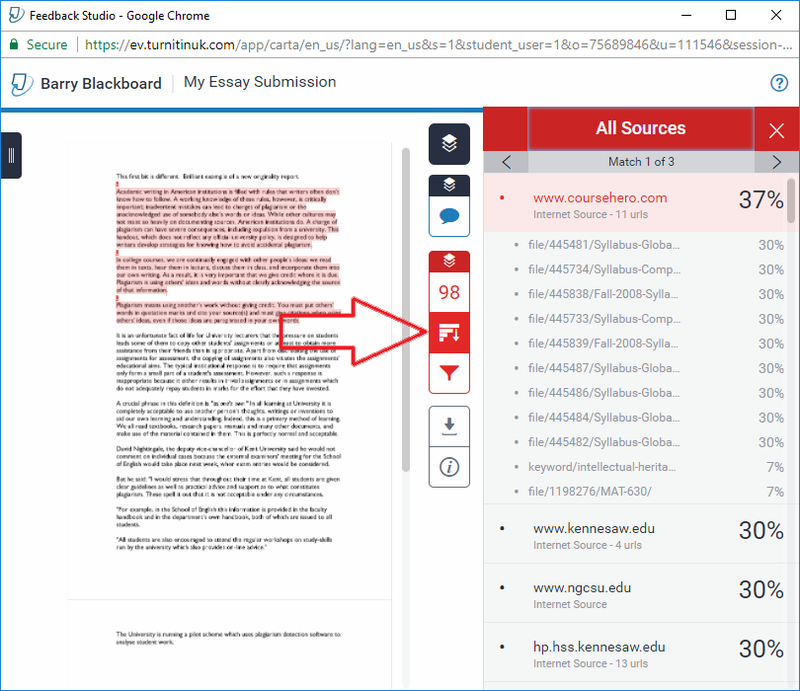 Clicking this link after you have submitted will allow you to check the submission you have made, and access related materials, including information about your assignment, and similarity reports / feedback / grades. The availability of similarity reports and feedback / grades depends on whether your tutor is using these features. 3. 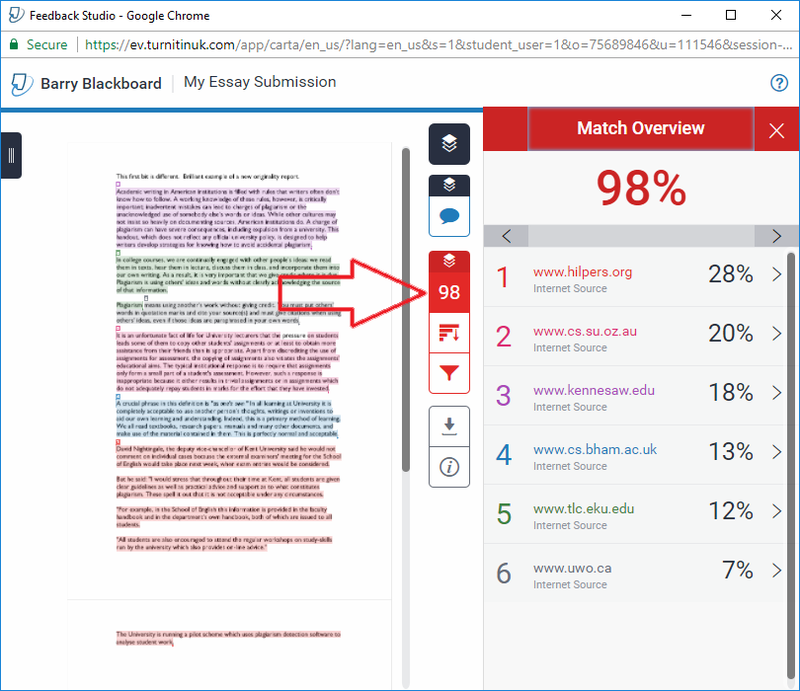 If your tutor has allowed you to see your similarity report (and if the report has been generated), you can click on your score to view the report. Your score will appear as a coloured box with a percentage next to it. The percentage shown is the percentage of selectable text in your work which has been found to match text in other sources (for instance web pages, online journals / publications, and previously submitted papers). If you are concerned about your similarity score you should seek guidance from your course instructor. 4. Your similarity report should load up in a new window. Any text which has been identified as matching text from other online sources will be highlighted in a different colour. On the right hand side you can see the similarity report tools (the red section on the right in the screenshot above). Each button is explained in the following steps. 5. The match overview button will show you a quick breakdown of the main matches which have been found in your work. At the top you will see the overall score (in this case 98%). Below that are each of the primary matches where text is found to have matched. You can click on each of these matches to see a further breakdown. 6. 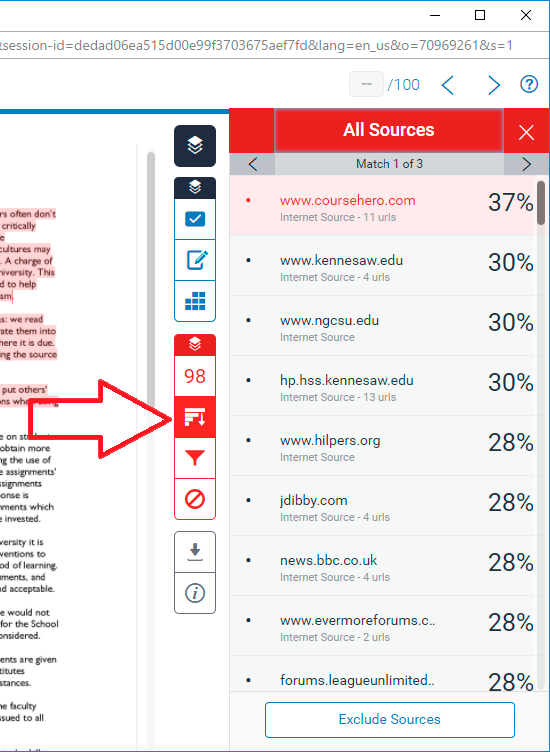 The ‘All Sources’ view will show you a more detailed view of every source where text in your paper has matched with text online. Again, you can click through each of the matches to see further details. 7. 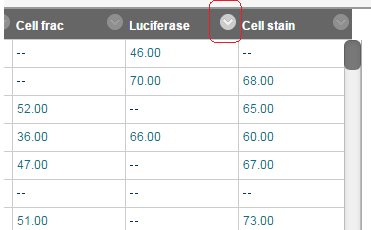 The filters and settings button allows you to filter your similarity report in various ways. You may wish to do this for numerous reasons, but you should ALWAYS make sure you are aware of the overall ‘headline’ score with all filtering turned off. The filtering which you apply to your report is only applicable to your view of the report. Your course instructor will see the unfiltered report, and has the ability to apply their own filters as per the settings shown above. If you have any queries about how to interpret the score and matches, you should talk to your course instructor. 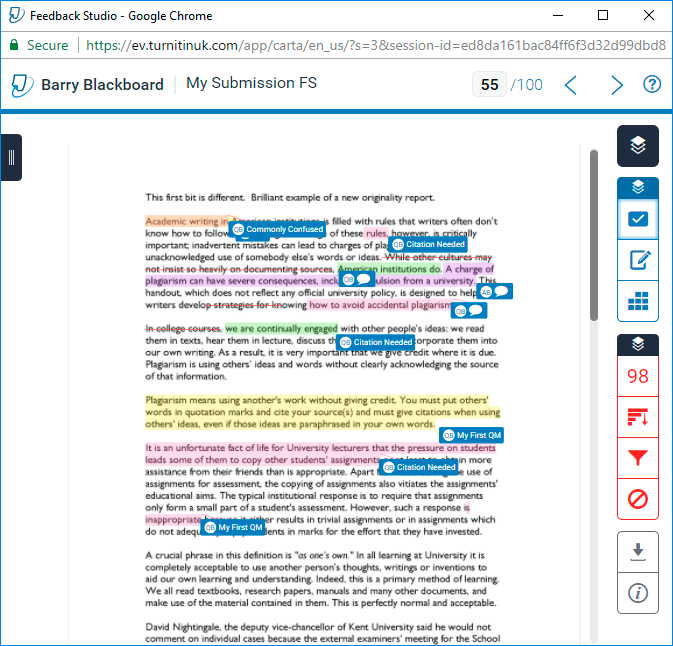 There is currently a rendering issue within Turnitin which may result in certain elements of some submissions being incorrectly rendered in the Turnitin online viewer under certain circumstances. 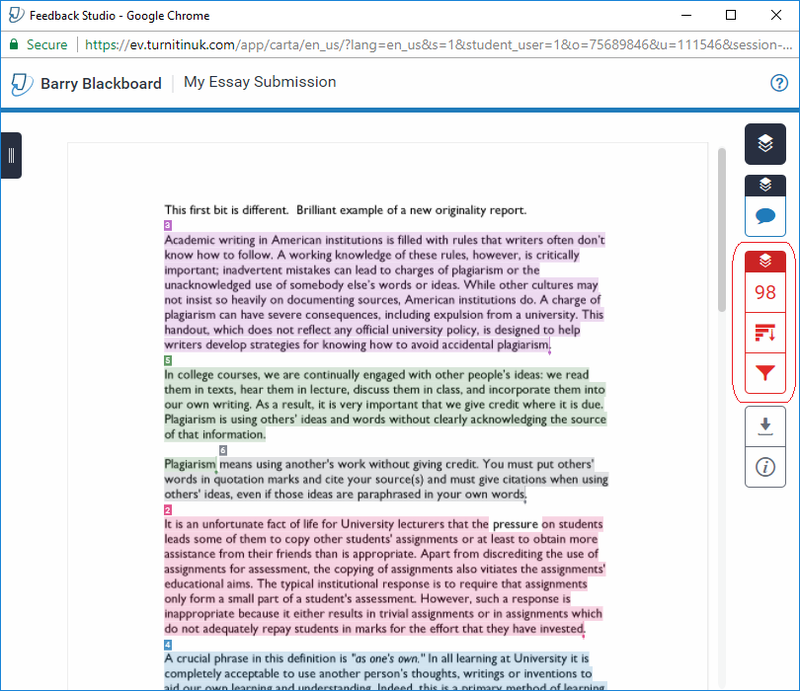 This issue may affect submissions where tables / graphs / images have been embedded / inserted / pasted into a Word document or Open Office document which has then been submitted to Turnitin in the native format which it was created in (for instance .docx for Word documents). We do not believe this to be widespread or to affect a large number of submissions. This issue does not occur where the document was saved and submitted as a PDF file rather than in the original file format of the authoring software, or where the document does not contain tables / graphs. The issue also does not affect the underlying file itself (which remains untouched). Students are therefore advised to save and submit their final work as a PDF when submitting to Turnitin. 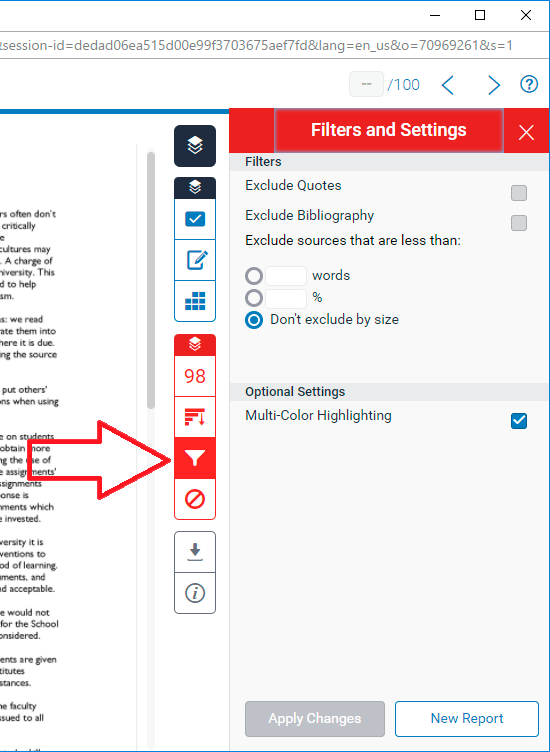 We would advise you to inform students of this when setting up assignments in Turnitin. 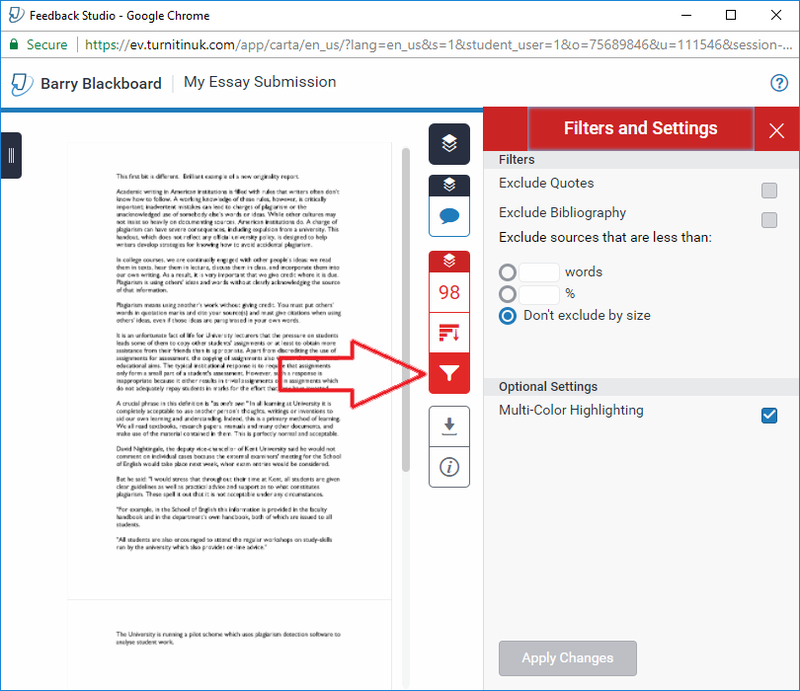 If you are using Turnitin on your course, please make students aware that they are advised to save and submit their work in PDF format in order to minimise any chance of this rendering issue occurring. 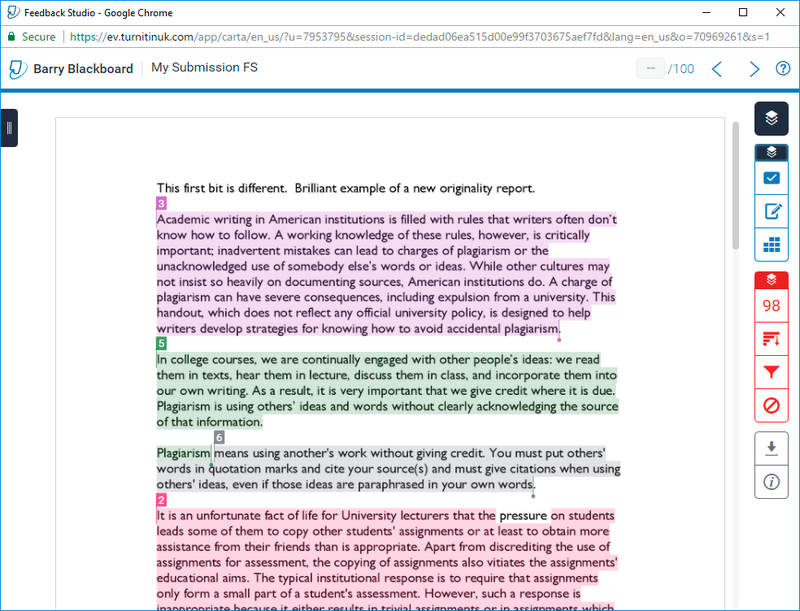 Turnitin have stated that this is not a widespread issue.